She's made from tiny cotton reels. I've lost count of how many Christmases she's hung on our tree. How lovely ,did you make her Jackie ? @Dawn no!!!!!!!!! Wouldn't know where to start!!!! She is gorgeous. Lots of memories here. How very sweet! The simple smile makes her into a future much loved character. In excelsis Gloria! She is adorable and she looks very happy to be on the tree again. terrific shot of this wonderful ornament. Is there a stroy with it? Hand made sweetness and tradition. How exceptionally special. No doubt Gloria sings angelically! She's lovely. It's a shame that cotton reels are now plastic - nowhere near as useful! She is so cute. I love ornaments that have meaning. @casablanca don't know where the name came from. ho's hubby dong?? more importantly hore you doing!? @wendyfrost except whe that darn cat gett he! @onewing well there should be but there aren't!! 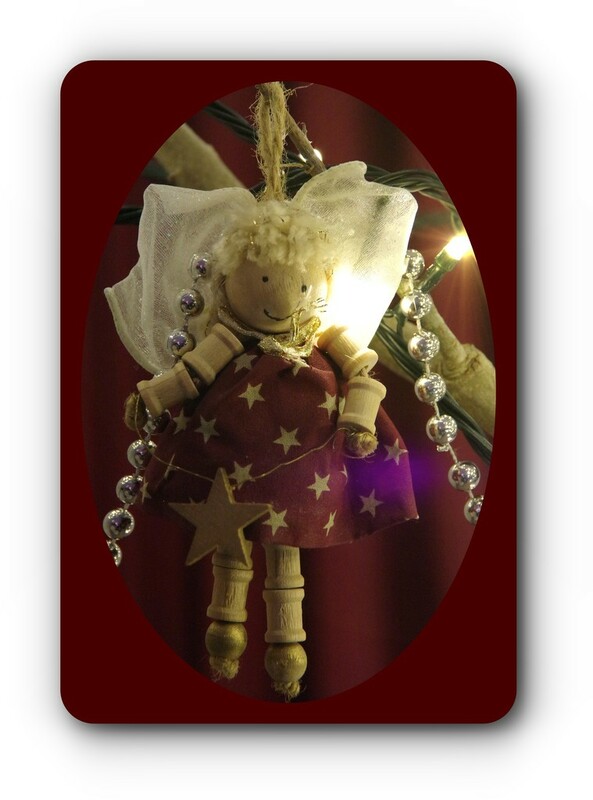 Thank you so much for you lovely comments on this angel/fairy, so gald you like her as much as we do!